South Florida offers many great family friendly activities and events! 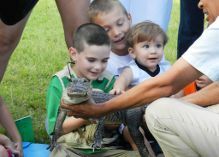 One my boys are sure to love is our trip set for this summer to go see the Gator Boys live and in action. Many of us have seen them on TV tackling gators and saving them from the dangers of people. However, only a few of us live close enough to hop in our cars and make the trip down to Everglades Holiday Park. If your unfamiliar with the Gator Boys they have been around Everglades Airboat Tours and The Gator Boys! Everglades Holiday Park is home to the Gator Boys of Animal Planet fame. That’s right, most episodes are filmed right here in our world-famous Everglades park filled with Alligators! There’s a good chance that while you’re here visiting, you’ll see the Gator Boys filming. You might even get to meet one of the stars of the show! Yes, you’ve come to the right place if you’re a Gator Boys fan, as we’re their official home in the Everglades! Come on down to visit them here! DON’T FORGET TO Register for Birthday Deals! Everglades Holiday Park - Home of the Gator Boys! Everglades Holiday Park Home of the Gator Boys Review!